Digital solutions provider Atos has revealed that the company has signed a major 3-year contract with the Centre for Development of Advanced Computing (C-DAC), an organization within the Ministry of Electronics & Information Technology, India (MeitY) to supply its BullSequana supercomputers. This new contract illustrates the strategic relationship and partnership between the two countries and marks India’s ambition to be a leader in HPC. Delivery is expected to start early 2019. This contract is part of the National Supercomputing Mission (NSM), a 7-year plan of INR 4500 crores (~650M$) led by the Government of India which aims to create a network of over 70 high-performance supercomputing facilities for various academic and research institutions across India. This project will see Atos deploy its BullSequana supercomputers, with a cumulative computing power of more than 10 petaflops. These supercomputers, including the recently announced BullSequana XH2000 will be installed in various academic and research institutions, making Atos a leading supercomputing provider in India for this segment. “We are honored to be given this opportunity by the Indian Authorities to be part of the NSM initiative and to become the technology partner of C-DAC for HPC-related platforms. We’re proud to be supporting India as one of the major markets with its strong growth expectations. The choice of the Indian government is the testament to our experience and expertise in high-performance supercomputing and I am delighted that our BullSequana, with its unique Direct Liquid Cooling platform, will be enabling Indian academic and research institutions to accelerate their research” said Pierre Barnabé, Chief Operating Officer, Big Data & Security at Atos. “We would like to thank the Hon’ble Minister MEIT, Secretary MEIT and the Director General of C-DAC Dr. Hemant Darbari for giving this opportunity to participate in such a prestigious program. We are very excited and looking forward to this unique technology partnership with C-DAC. Besides delivery of the Make in India Supercomputers, the partnership will bring to bear cooperation in many emerging areas, including exascale computing, artificial intelligence, and quantum computing.” Said Arvind Bajaj, Vice President and Head Big Data & Security at Atos in India. 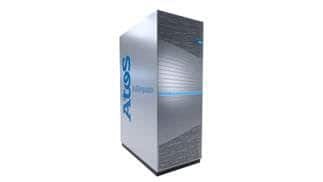 Atos to support Indian government in its National Supercomputing Mission 0 out of 5 based on 0 ratings. 0 user reviews.